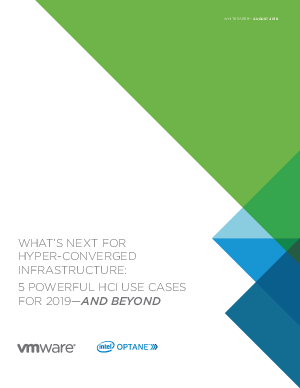 Since Hyper Converged Infrastructure (HCI) emerged as a breakthrough technology, it has continued to gain taction as it has truly delivered on its promise. It has helped organizations optimize resources, reduce complexity, lower costs, increase agility and accelerate development cycles, as well as provide a seamless path to hybrid cloud. These are just a few of the key benefits causing IT leaders pay close attention to HCI and look at ways to use it to power key initiatives such as digital transformation. As IT leaders continue to embrace HCI and the market is expected to grow at a compound annual rate of 42% through 2023, the future is happening now. Submit the form to read our latest whitepaper and discover 5 powerful HCI use cases around business-critical applications, hybrid cloud, disaster recovery, edge computing, containers and app development.